The meadow vole makes extensive runways through vegetation, and is a proficient digger and swimmer. Voles are rodents that have fuzzy coats and short tails. They mainly live in and eat grass. They are scientifically distinguished from other Alaska mice by having the grinding surfaces of the molars flat-crowned with an enamel pattern composed of alternating triangles. 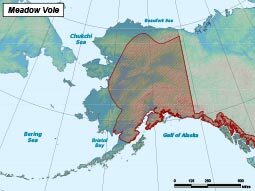 Seven species of voles occur in Alaska. Meadow voles, belonging to the genus Microtus, are colored brown or gray and are mainly found in habitats with grass. They range in length from 128–195 mm including the tail, and average 44 grams in weight. Breeding starts during late winter and continues until August. The gestation period is about 21 days, and then 4–8 young are born blind and naked. The young are weaned at 2 weeks and reach maturity at 3–6 weeks when they themselves may start breeding. Females can have six litters per year; thus in a short period, voles can become very numerous. Voles live about one year. Microtus voles eat mainly grasses and seeds, while the red-backed voles are omnivorous and will eat grass, seeds, fruit, lichens, fungi, insects and meat. 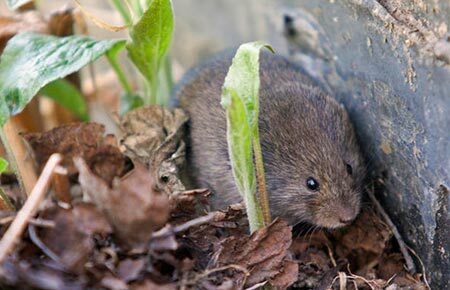 If a vole is caught in a trap, others will feed upon the trapped vole. Both the Microtus and red-backed voles form the base of the food chain for many animals in Alaska. Both the Microtus and red-backed voles form the base of the food chain for many animals in Alaska. They are the staple foods of weasels, marten, foxes, coyotes, all owls, most hawks, inland breeding gulls, jaegers, and occasionally great blue herons, domestic cats, northern pike, and other voles. The meadow vole (M. pennsylvanicus) is found in Interior and Southcentral Alaska west to Bristol Bay. It does not occur on Kodiak Island or on the Alaska Peninsula. In Southeast Alaska it occurs only on the mainland and on Admiralty Island. The Microtus voles live in small colonies of a few to 300 individuals in grass meadows where they build distinctive runways which crisscross the area. Often, grass cuttings can be found in these runways. They also dig underground burrows where they construct food and nesting chambers. Voles do not hibernate and are active throughout the winter. During the winter in snow covered areas, the voles make runways beneath the snow and feed on the snow-flattened grasses. They also burrow up through the snow to reach grass seed heads using various levels within the snow pack. Immediately after the snow melts, their runways often become visible on the ground. Interior and Southcentral Alaska and west to Bristol Bay. Gestation period is about 21 days, and then 4-8 young are born.